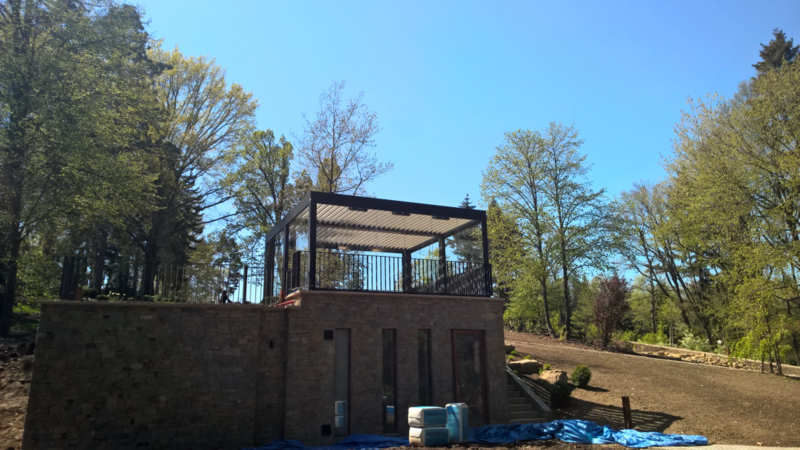 The PLACEO pergola system represents a unique approach to shielding, roofing and controllable ventilation. It is designed in minimalistic style with a flat roof and acute rectangular features of supporting construction. 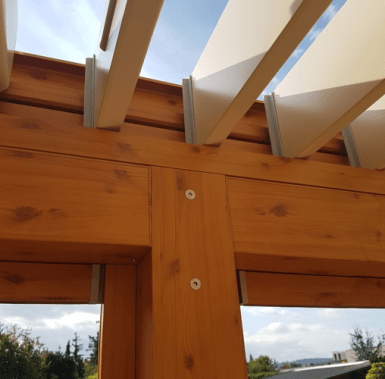 Thanks to the unique shape of the roof profiles, the system in the closed position drains rain water perfectly, providing a dry environment in the area under the pergola. 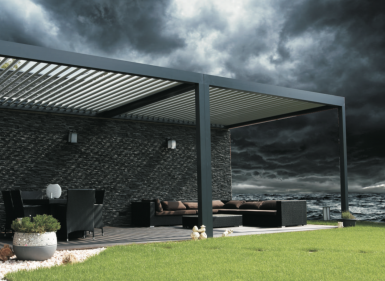 With the pergola made of a compact aluminium alloy with stainless steel components, the perfect resistence is guaranteed. System is ready for the implementation of other components – sliding aluminium systems, screen transparent PVC roller, etc. Pergola PLACEO in wood design represents 2017 innovation of company Alaris Czech Republic, s. r. o. Thanks to this design, customers who like wooden pergolas but who do not like taking care of it have an ideal opportunity of aluminium pergola with wooden look. 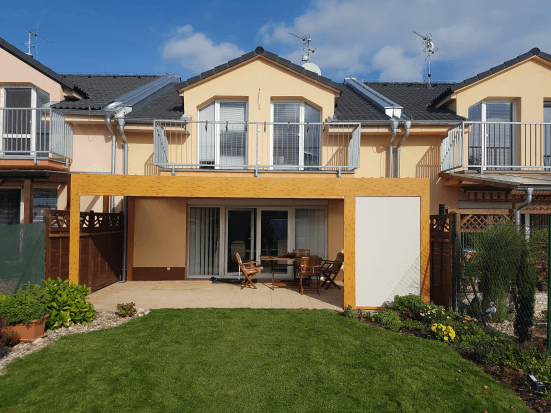 There is no need to take care of pergola and the comparison of aluminium pergola with wooden one is practically nonsense. The wood design of pergola goes hand in hand especially with sloping roof houses. 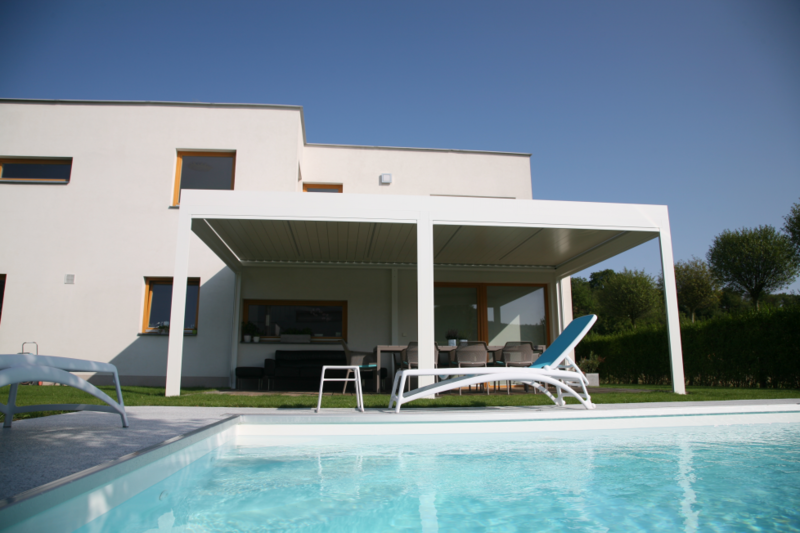 The maximum lenght of one pergola PLACEO (one unit) which is made by Alaris Czech Republic is 6 950 mm. There is a possibility to connect more units together in various combinations. Pergola PLACEO which is juxtaposed of more units is called twin pergola. By connection of more units there is not only the advantage in lenght itself but also the advantage in arbitrary orientation of roof blades within seperated units. 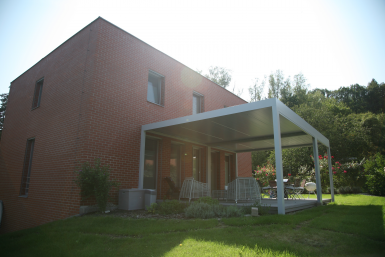 Therefore the roof can be adapted according to the concrete request. In contrast with free-standing unit, there is also a possiblity of anchoring of the construction into the wall. 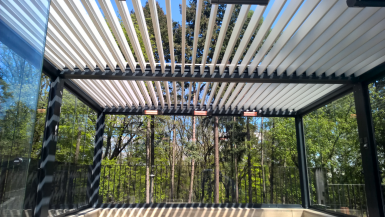 In this case, pergola PLACEO must have one column while any other columns are optional. This type is called corner pergola. 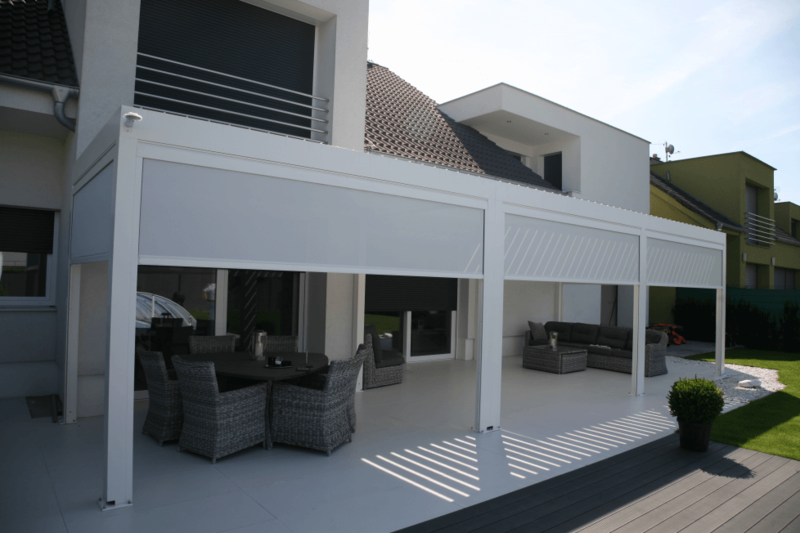 The other favourite accessory of pergola PLACEO is rain and wind sensor. It functions as a protection against unexpectable weather. 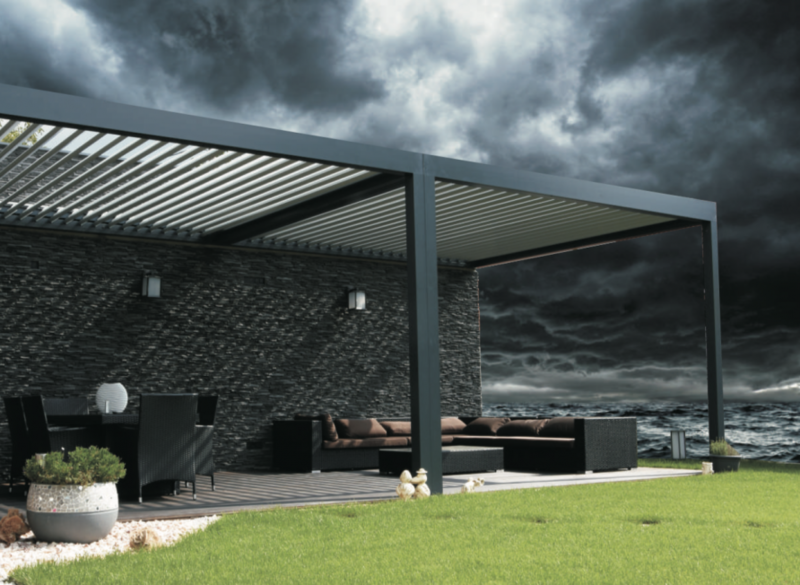 If unexpectable weather in the form of rain, thunderstorm or strong wind comes, pergola PLACEO closes authomatically. Thanks to this sensor, the environment and all of things under pergola PLACEO keep safe. 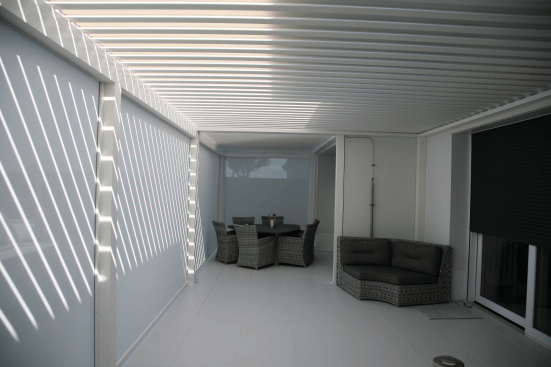 Pergola PLACEO can be made in any colour version according to the RAL sampler. Company Alaris Czech Republic cooperate with the coating company, where the profiles are powder coated. The RAL sampler contains a wide range of colours. A custumer could choose any colour for the construction itself as well as for the roof blades. 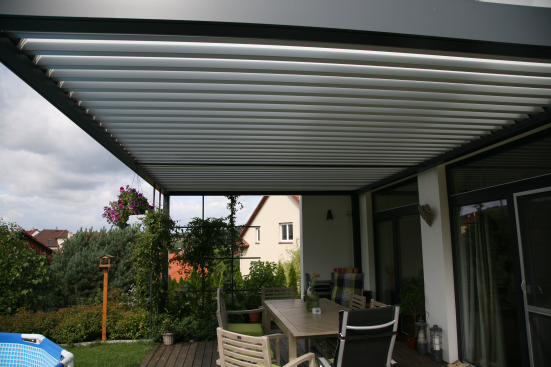 As for the roof blades, bright colours are recommended because of the overheating and the spreading of light under the pergola. 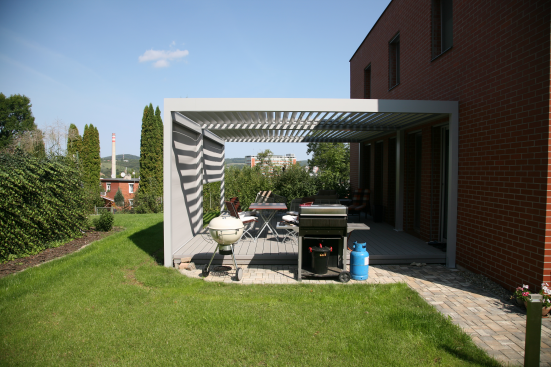 Besides the RAL sampler, company Alaris Czech Republic offers pergola PLACEO in carbon desgin (matt or shine). This embodiment looks very luxoriously. One of the advantages of pergola PLACEO is also the fact that pergola can occur as a free-standing construction anywhere in space. It is possible thanks to the special consturction made of solid stable aluminium profiles and strong fasteners. That is why pergola PLACEO takes attribute free-standing.